Nordic Energy Research is an intergovernmental organisation within the framework of the Nordic Council of Ministers. Nordic Energy Research is the platform for cooperative energy research and policy development under the auspices of Nordic Council of Ministers. We have a staff of 12 and are based in Oslo together with our sister organisations Nordforsk and Nordic Innovation. Nordic cooperation in energy research started 1975, leading to common pot research funding since 1985 and the establishment of Nordic Energy Research as an institution under the Nordic Council of Ministers in 1999. The Board comprises representatives from the authorities and ministries responsible for energy research funding in the five Nordic countries, who contribute the majority of the organisation’s funding. Read more in Nordic Energy Research’s strategy. The Nordic region has ambitious goals to reduce carbon emissions and its dependence of fossil fuels, and at the same time create new growth industries based on green technology. Nordic Energy Research funds research of joint Nordic interest that supports these ambitions by expanding knowledge on sustainable energy and contributing to the development of new, competitive energy solutions. Nordic Energy Research has a unique strength in that our governance structure is closely connected to both the national political systems of the five Nordic countries as well as the intergovernmental Nordic system. Our board and other committees and project steering groups consist not only of representatives from national funding agencies, but also from national energy authorities, ministries and the Nordic Council of Ministers secretariat. This creates a constant interaction between research strategies, results and key issues on the political agenda. We manage a number of projects and facilitate Ministerial working groups that provide input to energy technology policy-making in the Nordic region. 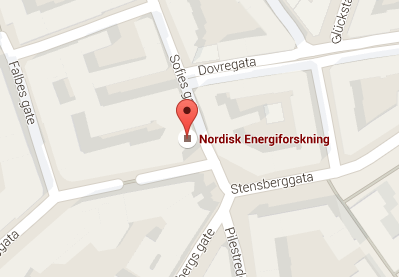 We are located at Stensberggata 27 in the centre of Oslo. From Oslo Airport (Gardermoen) the Airport Express Train (Flytoget) takes 28 minutes to reach Nationaltheatret. Trains depart every 10 minutes but only every other train stops at Nationaltheatret. From there it is a 10 minute walk to our offices. From Oslo Central Station take tram 17 or 18 towards Rikshospitalet and get off at Høyskolesenteret. From there, take a few steps in the direction the tram came from and turn left onto Stensberggata.